From the wonderfully warped imagination of Tim Burton comes the story of Barnabas Collins (Johnny Depp), a dashing aristocrat who is turned into a vampire by a jilted lover and entombed for two centuries. Emerging from his coffin into the world of 1972, he returns to his once-majestic home, only to the few dysfunctional descendants of the Collins family who remain. Determined to return his family name to its former glory, Barnabas is thwarted at every turn by his former lover - the seductive witch Angelique (Eva Green) - in this wildly imaginative adventure" (Sam Hallenbeck, NBC-TV). $29.685 million on 3755 screens. Tim Burton again shows his love for remakes/readaptations with 2012’s Dark Shadows, a new take on the soap opera from the 1960s. A prologue takes us to Liverpool circa 1760 and introduces us to youngsters Barnabas Collins (Vincent Curson Smith) and Angelique Bouchard (Raffey Cassidy). Both accompany their families on a journey to America, though they come from different social spheres. The Collins family settles in Maine, where father Joshua (Ivan Kaye) launches a fishing company so successful that the town gets named “Collinsport” – and they build a massive manor they call “Collinwood”. Despite all these advantages, tragedy befalls the Collins clan. In 1775, the now-adult Barnabas (Johnny Depp) and Angelique (Eva Green) engage in an affair, but when Barnabas rebuffs Angelique’s desire for love, she decides to curse him and apparently uses magic to cause the “accidental” death of his parents. Barnabas suspects supernatural foul play and delves into the dark arts on his own. In the meantime, Barnabas finds his “one true love”: Josette DuPres (Bella Heathcote). The jealous Angelique doesn’t take kindly to this competition; she casts a spell on Josette that forces the young lady to leap to her death. Despondent, Barnabas jumps after her, but curiously, he survives. It turns out that Angelique used her powers to turn Barnabas into a vampire so he could suffer his grief and pain forever. Angelique then tells the locals of Barnabas’s supernatural status, so they bury him alive. With that, we head to 1972 and meet Victoria Winters (Heathcote), a young woman who travels to Collinsport to become governess to David Collins (Gulliver McGrath), a youngster who apparently went a bit balmy after the passing of his mother. Victoria comes to a Collinwood headed by matriarch Elizabeth Collins Stoddard (Michelle Pfeiffer), and she also meets other members of the clan as well as Dr. Julia Hoffman (Helena Bonham Carter), a psychiatrist there to treat David. Before too long, Barnabas reappears as well after construction workers accidentally dig up his coffin. He returns to reclaim his place at Collinwood as well as adjust to modern society and eventually deal with Angelique; the witch has essentially made herself immortal, and she still presents a major thorn in Barnabas’s side. Not that long ago, I greeted every Tim Burton picture with eager anticipation. But now I find it tough to do so. 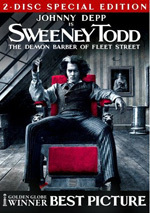 Despite the occasional winner like 2004’s Big Fish and 2008’s Sweeney Todd, Burton has mostly produced stinkers such as Charlie and the Chocolate Factory, Planet of the Apes and Alice in Wonderland. Dark Shadows does nothing to improve that trajectory. Indeed, it might be the biggest clunker of the bunch, as it provides a relentlessly mediocre experience without much to make it memorable. And by “without much”, I mean “with pretty much nothing”. Even Burton’s usual sense of visual creativity fails to appear here, as virtually nothing about Shadows looks inventive or interesting. Actually, that’s not true; some of the hidden rooms look kind of cool, but that’s about it. For a movie about vampires and magic, there’s precious little visual flair on display. The film’s biggest flaws stem from its mess of a script, however. At its heart, Shadows possesses a pretty simple narrative: it’s about Barnabas’ love for Josette/Victoria and his battle against Angelique. However, the movie’s not happy to stay with those three, so it tacks on abundant subplots. We get the attempts to resurrect the Collins Canning business, the affairs of the two Collins kids, Roger’s neglect of his son, and Dr. Hoffman’s desires for eternal life. That’s a whole lot to pack into a sub-two-hour movie, and screenwriter Seth Grahame-Smith fails to meld the components in a satisfying manner. Rather than develop them smoothly, many characters/themes vanish for extended periods. One minute we're invested in Victoria’s story, but then we lose track to deal with another “now you see it, now you don’t” component. This makes Shadows a jerky narrative that never seems to know where it wants to go. Essentially, the script puts the reins on Barnabas and expects us to be entertained by his presence and little else. Depp remains a fine actor, but he can’t carry this disjointed tale all on his own. Plot threads come and go so randomly that we just don’t much care about Barnabas and his quest; even Depp’s formidable talents can’t do much to engage us. It doesn’t help that Burton seems a bit unsure whether or not to make a “fish out of water” spoof/comedy or a romantic horror tale. Though ads sold Shadows as the former, it leans much more closely to the latter. The film comes with more violence and fighting than expected. < Which is probably a good idea, as the movie’s comedy falls flat. I originally saw Shadows in an audience of about 20 people, and the flick’s jokes were greeted with near-total silence. I might’ve heard a chuckle or two along the way, but that was it; the attempts at comedy didn’t work. Some of the action fares better, but even at the film’s best – such as when excavators discover Barnabas and he feasts – Shadows doesn’t seem very inspired. Even that moderately interesting sequence feels like something out of Jurassic Park. All of this makes for a slow, dull film. I think Shadows had some potential, and it tries to differentiate itself from the scores of other vampire movies we’ve gotten in recent years, but it just lacks the entertainment value to make it worthwhile. Dark Shadows appears in an aspect ratio of approximately 1.85:1 on this Blu-Ray Disc. Though not stellar, the image was usually more than satisfactory. Sharpness had some ups and downs, though not many. Some shots occasionally looked a bit soft, usually in wider elements. However, the majority of the flick demonstrated good delineation and accuracy. I witnessed no problems with jaggies or moiré effects, and edge haloes remained absent. I also saw no signs of print flaws. Given the movie’s tone, it went with a subdued palette. A fairly blue-gray tint dominated, though some brighter hues popped up, mostly via a mix of reds; we also got purples at the Collinwood “happening”. Within the intended design, the colors looked fine. Don’t expect much, though, as the film remained pretty monochromatic. Blacks were deep and tight, while shadows could be a bit erratic; most showed good definition, but a few tended toward mild thickness. Though the image didn’t provide consistent pleasures, it offered a better than average presentation. I also felt pleased with the movie’s DTS-HD MA 5.1 soundtrack. Though Shadows came with a lot of comedy and quiet character moments, it still delivered enough action to enliven the proceedings. These used the various speakers in an active manner and created a rich setting for events. In particular, supernatural elements opened up the track and provided solid material. Audio quality was strong. Music sounded full and dynamic, with crisp highs and tight lows. Dialogue seemed concise and natural, while effects showed good clarity and accuracy. Bass response powered the track with a real kick, and I heard no distortion or roughness. Though the mix lacked the consistent pop to merit “A”-level consideration, but it was worth a solid “B+”. Only a few extras fill out the set. We get nine featurettes under the Focus Points banner. These cover “Becoming Barnabas” (5:23), “Welcome to Collinsport!” (4:26), “The Collinses: Every Family Has Its Demons” (6:49), “Reliving a Decade” (4:54), “Angelique: A Witch Scorned” (2:58), “Alice Cooper Rocks Collinsport!” (2:25), “Dark Shadowy Secrets” (3:53), “A Melee of Monstrous Proportions” (3:59), and “Dark Shadows: The Legend Bites Back” (2:05). Across these, we hear from director Tim Burton, makeup department head/prosthetics makeup designer Joel Harlow, costume designer Colleen Atwood, production designer Rick Heinrichs, visual effects supervisor Angus Bickerton, associate producer Derek Frey, marine coordinator Ian Creed, set decorator John Bush, special effects supervisor Joss Williams, producer Richard D. Zanuck, visual effects producer Barrie Hemsley, stunt coordinator Eunice Huthart, screenwriter Seth Grahame-Smith and actors Johnny Depp, Christopher Lee, Alice Cooper, Helena Bonham Carter, Eva Green, Jackie Earle Haley, Jonny Lee Miller, Chloe Grace Moretz, Michelle Pfeiffer, Bella Heathcote, and Gully McGrath. The “Points” cover cast, characters and performances, makeup and costumes, sets and locations, production design and period details, music, various effects, stunts and action, and thoughts about the horror genre. While they don’t substitute for a comprehensive documentary, they “Points” do tell us a fair amount about the production. Despite their light, promotional bent, they give us some quality information. Five Deleted Scenes occupy a total of five minutes, 39 seconds. Don’t expect a ton from these, as they mostly deliver character notes; four of the five deliver basic chats among the participants, none of which tell us anything new. The fifth shows a traffic stop as the cops seem to suspect Willie of being the murderer; it’s moderately more interesting than the others, but none of these would’ve done anything to help the movie. The disc opens with an ad for Thunderstruck. No trailer for Dark Shadows appears here. A second disc offers a DVD copy of Shadows. It provides a retail version that includes one of the nine “Focus Points” but no other extras. 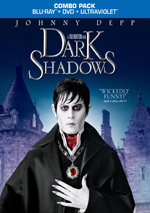 With an aimless narrative and an inconsistent tone, Dark Shadows lacks much to make it entertaining. It does boast a nice cast but the movie doesn’t know where it wants to go, so it takes the audience on a meandering ride. The Blu-ray delivers good picture and audio along with a small set of useful supplements. While I have no complaints about this Blu-ray, the movie itself remains a disappointment.